The Phönix, designed by a Polish locksmith, was originally called Merkur but the name was changed to Phönix (the firebird) after the producer changed its name to 'Company for the production of machines and appliances'. 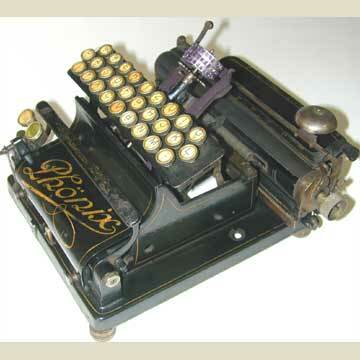 With the Lambert, the Phönix is the only machine with a fixed keyboard. But the first comparison of course is with the Blickensderfer. The raised typewheel that strikes down onto the platen is very close to the system that made the Blick great. But the keyboard on this machine is very odd. When a key is pushed, the entire keyboard tilts and goes down, while turning the typewheel into position and printing the paper. The keyboard has 28 keys and there are two shift keys for capitals and characters. The machine was produced for a very short time only and few examples survive.